This week Adelaide Food Central hosted a special dinner to celebrate the media launch of Bakmi Lim Noodle Project. 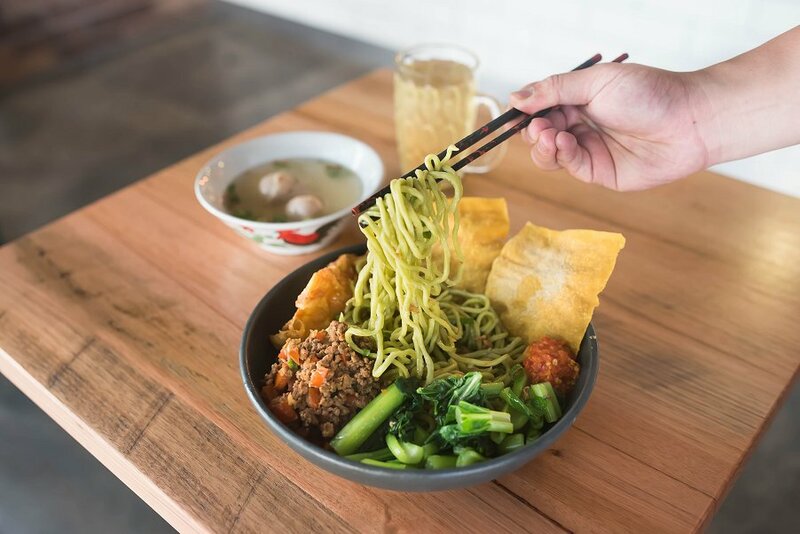 Located on Waymouth street in the city, Bakmi Lim specialises in handmade Indonesian inspired noodles and sides with a takeaway style approach and authenticity. Bakmi Lim, translates to Lim’s Noodles in Indonesian. The owner and chef, David Lim developed his love for Noodles from his upbringing in Indonesia and learning to make Noodles with his father at an early age. He is now continuing on his father’s legacy with making noodles from scratch, in house everyday for his customers at Bakmi Lim. The restaurant is small but cosy, with a general focus on tasty takeaway style food and drinks. We were offered a choice of their three speciality drinks upon arrival including Organic Soy Milk, Indonesian Sweetened Black Tea and Chrysanthemum tea. All of which were raved about throughout the night for having the right amount of sweetness and being very delicious. The Organic Soy Milk was a favourite amongst guests as it is freshly brewed in house, much like the other drinks giving it a special taste. Guests were treated to a choice of three Noodle dishes as well as many sides to sample throughout the night. I opted for the Spinach Infused Noodles with BBQ and Roast Pork served with Choy Sum, Spring Onion, Shallots and Chilli on the side. Other choices included Spinach Infused Noodles with Tofu Mushroom and the Traditional Noodle with Lim’s Soy Chicken Mushroom. I loved the Combination Pork Noodles. The Roast Pork was crispy and tender and the BBQ Pork had an amazing flavour. The noodles itself definitely set this dish apart from any other noodles I have tried before. You can taste the love and care that goes into making these noodles. They were coated in a Chicken Broth, which gave it a subtle yet tasty flavour, allowing the noodles to shine without being over powered with a heavy sauce. These noodles will make you want to eat them everyday, maybe even for breakfast as David says he and his family enjoy back in Indonesia. New to Bakmi Lim’s menu are Lim’s Baos. 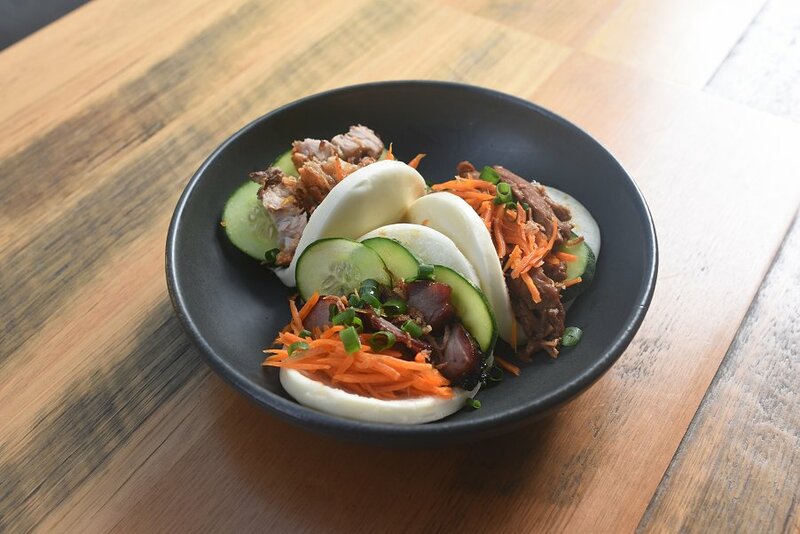 These are hot steamed buns filled with either Roast Pork, BBQ Pork or Chicken and served with fresh Cucumber and Pickled Carrot. These are absolutely delicious. I tried the BBQ Pork Bao and it was so tasty I wanted more. The bun is perfectly soft and slightly sweet the way it should be, and they had a generous amount of filling. Next time I visit I would love to try the Chicken and Roast Pork options. They also offer Mushroom and Tofu as Vegan alternatives. The Crispy Wontons, Boiled Wontons and Beef Meatballs were enjoyed by all and each were delicious. I especially enjoyed the Crispy Wontons which were perfectly crisp and had a deliciously moist Prawn filling. All of which were of course homemade, making all the difference and setting them apart from others. As Chef David Lim says himself: ‘Everything is made from scratch with Passion, Dedication and Love.’ You can really tell that a lot of love and care goes into the food at Bakmi Lim, which is their point of difference to any other restaurant in Adelaide. Bakmi Lim is hoping to expand in the future and even try out new menu options such as desserts so watch this space. In the meantime though do yourself a favour and head down to Waymouth Street to try Bakmi Lim’s amazing Noodles because they are sure to knock your socks off.